This week, my 13-year old twins participated in the Probability Carnival at their school. It is a recently hatched tradition (It wasn't around when my 11th grader was their age) in which students gather in small groups to make a carnival-type game and and figure out the probability of various outcomes. My kids are boardwalk junkies, so this seemed like an easy one. But we are three for three in that they all originally came up with games of skill rather than chance. Skill messes with probability, apparently. But I'm not going to pretend I took any math skills away even though three of my kids have done it (and I have played all of the games.) What I will tell you is that I am very familiar with a carnival type of game that does not require skill: the Zoo Dip. But I have never really told my kids about it. Let me back up. Picture this scene: A county fair in the mid-Atlantic, circa 1981. There are horse rides, sno-cones and crafts, but where was I? I was at the Zoo Dip. The Zoo Dip, for the uninitiated, is a game of chance that was once popular at fairs. The player buys a ticket (or 3 for $5!!) that is cleverly folded up so that the user must rip it apart to see the number on it. The user then compares the number to a list of numbers on a board. If there is a match, BLAM-O, the user wins the corresponding stuffed animal. In the summers of my pre-adolescence, it was my goal to win as many zoo dips as possible. My sister had started a make-your-own button business. One of those die-cast metal presses that enfolds the sticker or Tiger Beat teen dream photo of your choice into a round pin you put on your army jacket/painter’s cap. We spent our weekends traveling to state, county and craft fairs within driving distance of our Washington, DC, home. We all wore royal blue off-brand golf shirts and khaki shorts. Sometimes my neighbor would come along to help with a side business of face painting, back when that meant a simple Ms. Pac Man on your cheek. But I had other things in mind. Stuffed animals. I was obsessed. It started with Rebecca, a train engineer my grandmother bought me from a taffy shop in Ocean City, Maryland. And there was Morgan, a charming pale pink dog with a wind up music box that played “How Much is that Doggy in the Window?” They were my favorites. But don’t tell the beach-ball sized frog with a jaunty black bow around his neck I got as a hand-me-down from my older brother. It started with four or five and grew to maybe 15 or so when relatives realized this was a way to my heart. Then came the zoo dip days. I don’t even remember any of the prizes exactly. I just remember the feeling of holding on to a little animal with paper eyes and styrofoam balls crammed inside its slightly-softer-than-felt hide. In those days, there were no Beanie Boos or Webkinz, and plush was for rich kids who shopped in department stores. My one true wish was to own a gigantic stuffed animal, like the huge Paddington Bear my mom and I saw once at Woodward and Lothrop (or Woodies, as it was known). Alas, it wasn’t to be. My youngest daughters were turning 10 in a few weeks, and so, in an act of righting all of my childhood wrongs, I brought a life sized teddy bear (or pre-trash, as my husband likes to call it — and he is the camera man here and was totally complicit in this purchase) into our home. 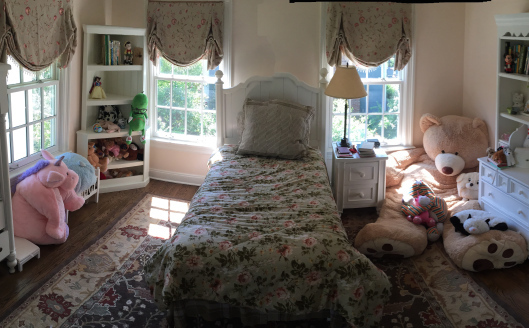 It’s a weird thing, because I really loved all of my stuffed animals when I was growing up. So much so that when my mom actually got me a new mini-Snoopy knockoff after I left mine in a rest stop bathroom, I was not blissful. All I could think about was where my “real” almost-Snoopy was living now. 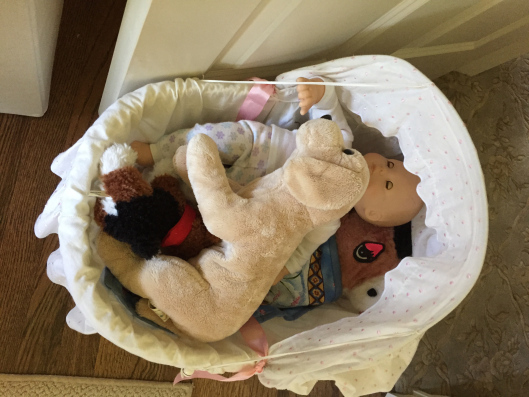 But though I definitely showered my kids with stuffed animals at first (and passed Morgan on, though Rebecca remains in the “Repair Shop” at my parents’ house), it hasn’t been an easy relationship as a parent. 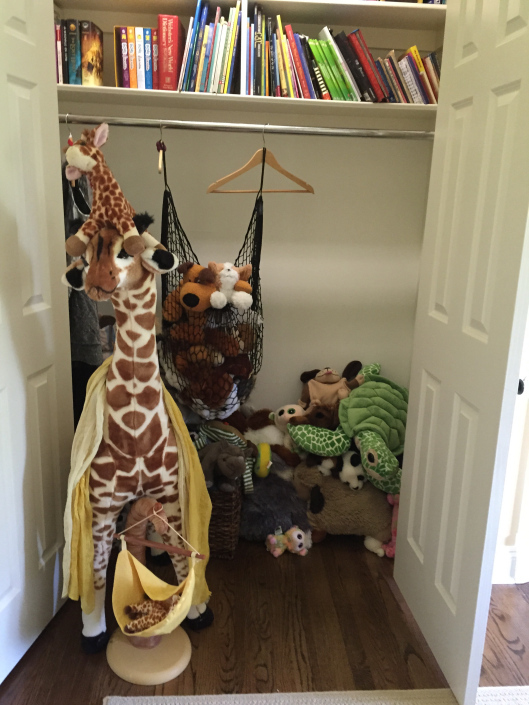 Very quickly four children racked up enough stuffed animals that we were unable to close bedroom doors or traverse toy room floors. We instituted an aggressive recycling policy (we gathered them all up and put them in trashbags in the basement and only brought back those that were specifically missed). 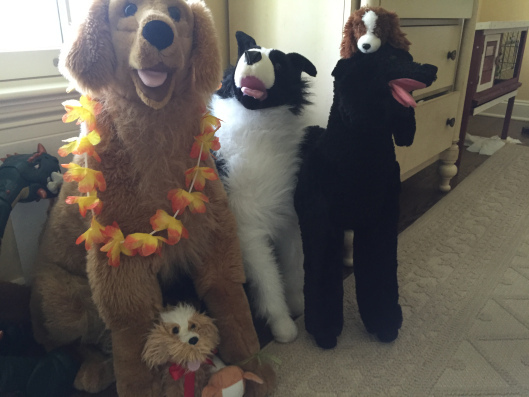 We even vowed never to bring more stuffed animals into the house. But then it seemed almost cruel. When you are at Disney World with your kids and you say they may pick out one souvenir, and that one souvenir is always and forever a stuffed animal, you start to wonder why you would say no. It’s what they really truly want, to a kid, every time. My son has backed off a bit, but I don’t think the girls will ever change. And it’s still a little sentimental for me. So now, we have stuffed animals in the house. A lot of stuffed animals. We still get them to choose their favorites and quietly phase out the others. I should mention that she is NOT the one who is obsessed. She just likes them.